Do you like slimy, cold, and adorable? I do! Frogs and salamanders abound in many of our State Parks, and late winter and early spring is one of the best times to find them. Amphibians are excellent indicators of ecosystem health, and tracking trends in their populations or productivity can help showcase changes in the environment before other species do. Besides, who can resist these eyes? 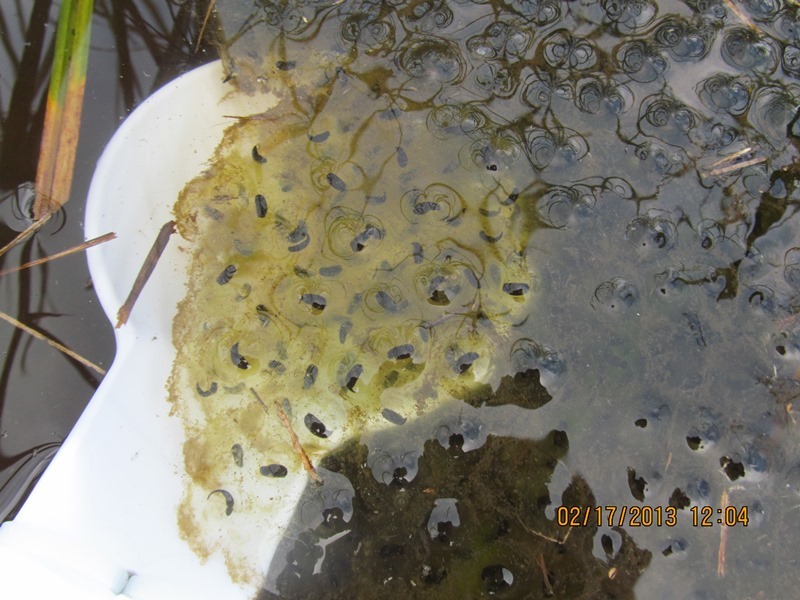 This past February OPRD’s wildlife program hosted surveys for lentic breeding amphibians at four of our parks. 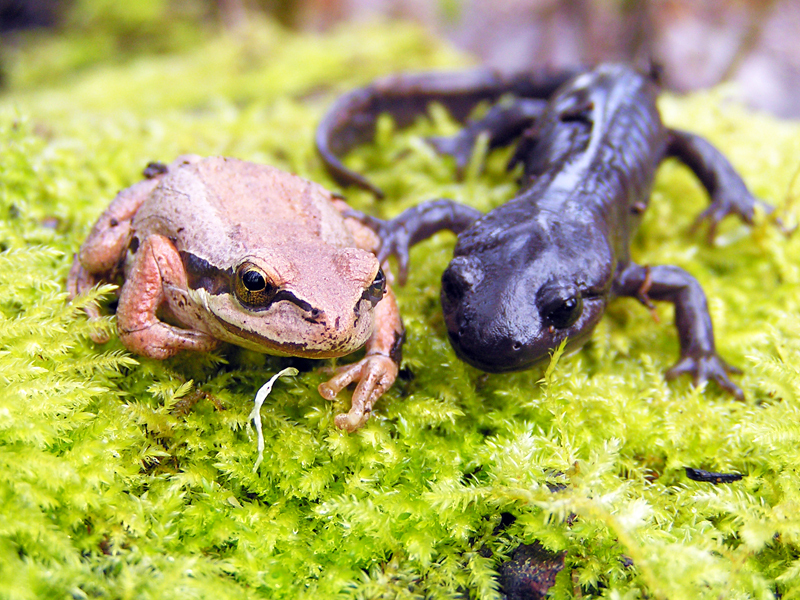 A “lentic breeding amphibian” is one that spends its adult life on the earth but lays its eggs in ponds or other still water places, like red-legged frogs (Rana aurora) and northwestern salamanders (Ambystoma gracile). 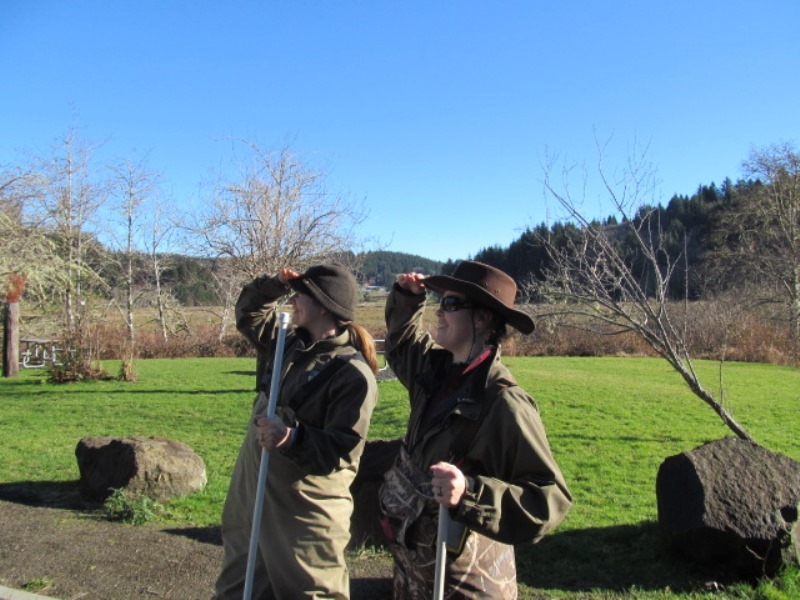 With the help of interns from Oregon State University, we donned waders, datasheets, and the mighty Swamp Stick to set out in the wetlands, marsh, and ponds at Beaver Creek Natural Area, Bower’s Rock State Park, Champoeg State Park, and Wapato Access. What, you might ask, is a Swamp Stick? Here I am with OPRD Natural Resource Specialist Katie Duzik, modeling the latest in amphibian tracking gear. The stick was craftily pieced together from PVC pipe, zipties, and a big spoon. It serves three functions: giving a nice white background to show what is in that dark water, a way to manipulate delicate amphibian egg masses without needing to touch them, and probably most important for staying dry, as a ground prodding stick to make sure there really is something solid in front of you! 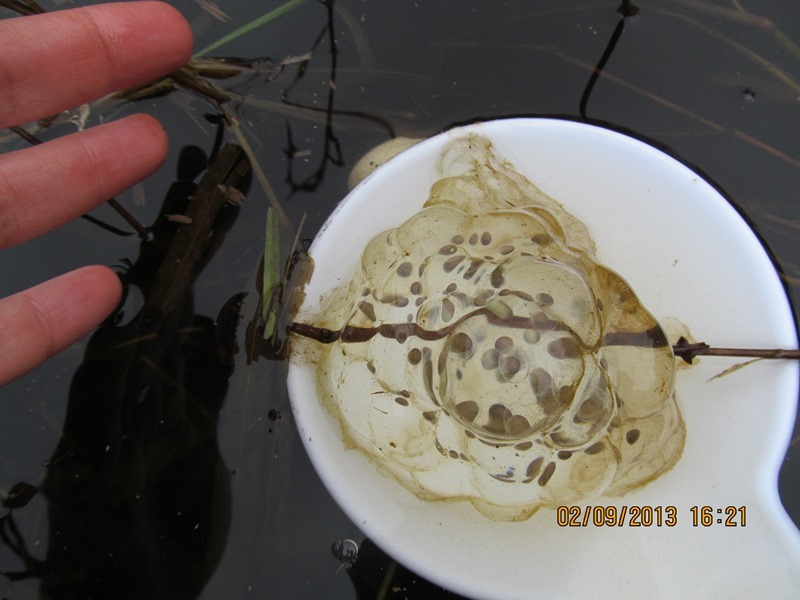 Here you can see the bottom of the Swamp Stick, the nice big spoon, showing off some red-legged frog eggs. 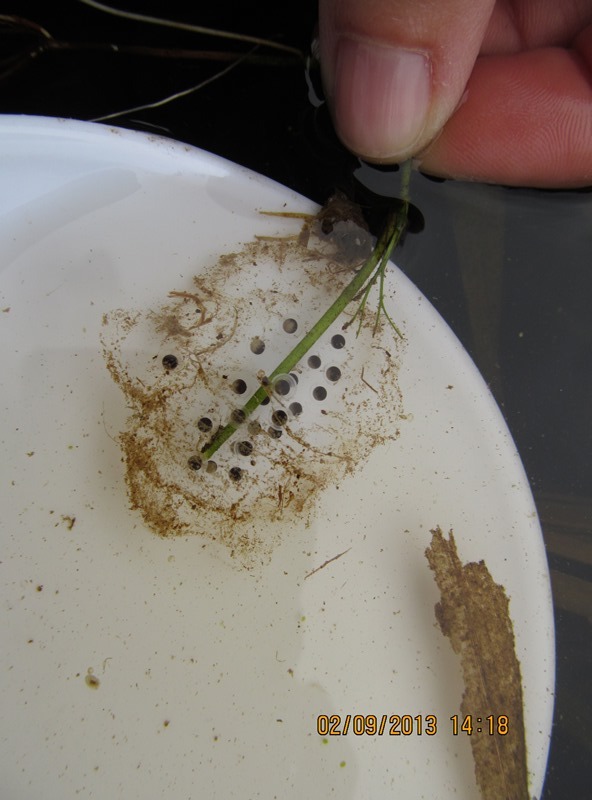 Handling egg masses could detach them from their anchoring vegetation, but sometimes you need to move them a bit to see what they are: Swamp Stick. 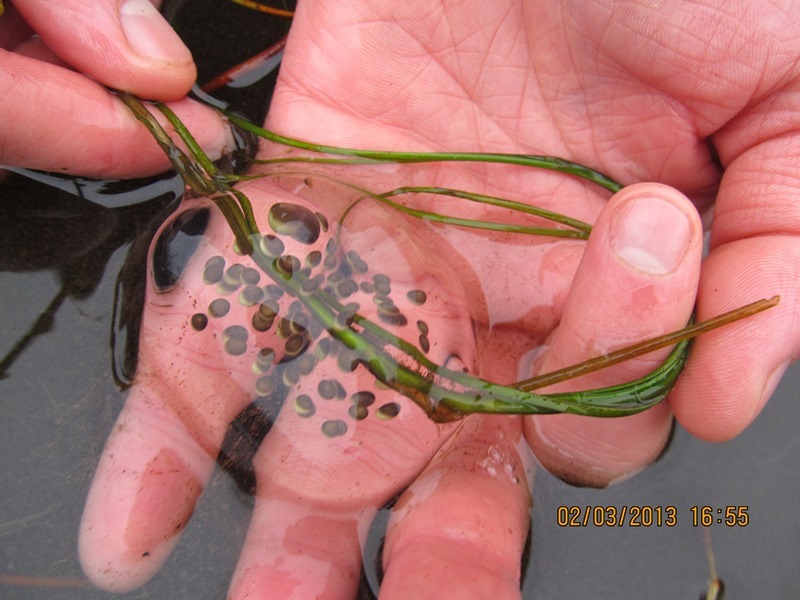 The young frogs are in the “tailed” stage, where you can see them starting to develop a tadpole-like form. Here are some more fantastic pictures! Now all the data is in a pile on my desk, waiting for analysis. Wait, I think I have a bird survey to go on… paperwork will have to wait for a rainy day!